Prague’s wealth of traditional coffeehouses is a legacy from the era of the Austro-Hungarian Empire. But even in today’s hectic time, grabbing a quick cup on the run is fortunately not the only option for coffee lovers in the Czech capital. 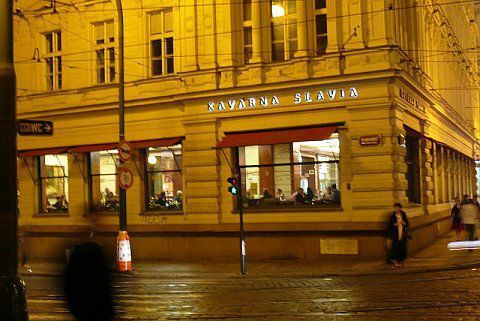 Probably the best-known café in the golden city is Kavárna Slavia, or Café Slavia. We recently visited this traditional coffeehouse. It is rare for Café Slavia to be this quiet – usually, the 300-seat art deco coffeehouse is crammed with guests and tourists are lining up by the door for a seat. 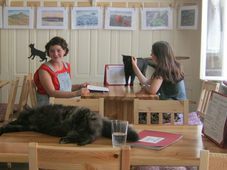 On a quiet Monday morning, however, just briefly after eight, you can soak up the beautiful leisurely atmosphere and have the café almost to yourself. Lucie Kleknerová, one of the managers at Slavia, joined me for a quiet cup of coffee and told me all about this legendary Prague institution, which first opened its doors in 1884. After the café first opened in August 1884, it quickly became a hotspot for lovers of culture –of course, this was due mostly to its proximity to the National Theater. 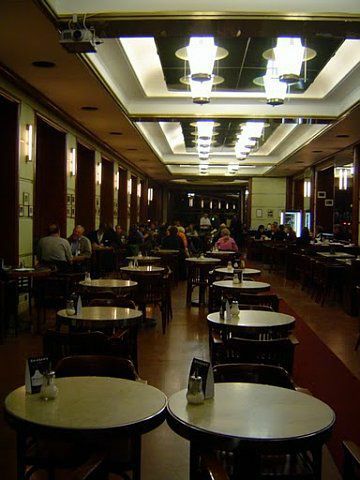 Among the regulars at Café Slavia at that time were the composer Bedřich Smetana, the actor Jindřich Mošna, poet Jaroslav Seifert, avant-garde writer Vítězslav Nezval, the famous Josef Čapek and many others. In a way, the list of visitors reads like a who-is-who of Bohemian culture at the time. During the era of the First Republic, the interior was changed to the popular style of art deco and has remained unchanged since then. 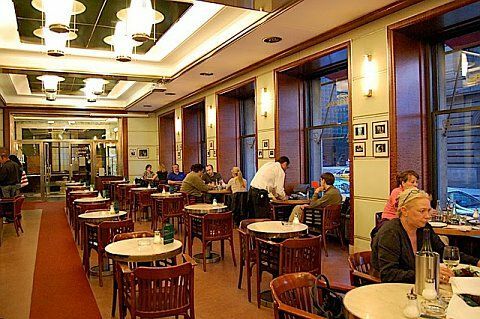 When you step inside Café Slavia, it almost feels as if you were taking a step back in time. The original Tonet chairs, the dark wood tables and the green marble walls evoke the long-gone glamorous era of the 1920s. Of course, much has changed since then, but is coffeehouse culture still going strong in Prague? I put the question to Lucie Kleknerová. You spend a lot of time here. What is your favorite time of the day at this café? “There are two times that it is very nice here. First, in the morning. We open at 8, and when you come in that early, you can see people who come for a cigarette, the newspapers and coffee. And it is really calm and nothing is rushed or stressful. Mostly these people are Czechs, they are business people who have meetings or lovers getting breakfast together. You said originally, the café opened as a place for theatergoers to get something to drink either before or after the show. Now, you still are just across the street from the National Theater, which remains a very active cultural institution. Has this tradition survived? 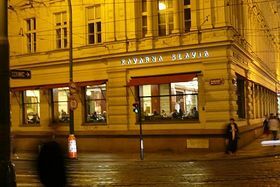 Of course, a coffeehouse is only as glamorous and interesting as its guests – and Café Slavia can pride itself in its long list of famous visitors, among them the late and much-beloved former president Václav Havel. 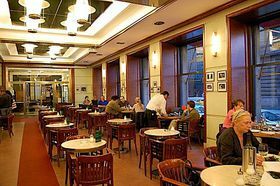 He was Lucie Kleknerová’s favorite guest, but she also has seen Hillary Clinton drink coffee here, and the well-known Czech-Jewish writer Arnošt Lustig was one of Café Slavia’s regulars as well. What was he like as a guest? 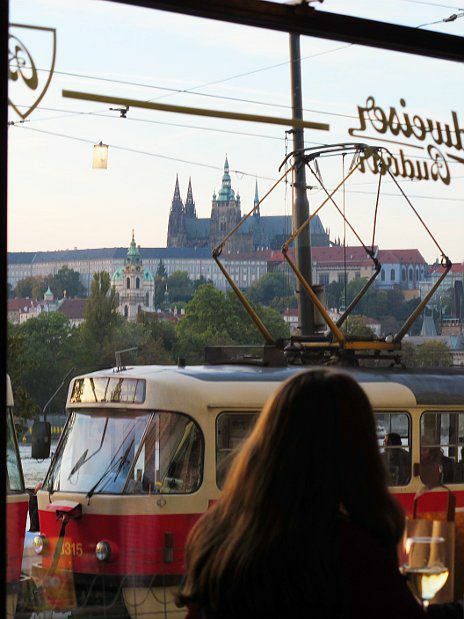 Maybe here we can stop and take a look at the phenomenal view you have from the windows of Café Slavia? So the window seats fill up quite quickly I believe? We are now walking towards one of the main draws of this café, the painting of the absinthe drinker. Maybe you could describe it a bit? The absinthe drinker, a painting by Viktor Oliva, has certainly become an important element of Café Slavia in the past 15 years – originally, a painting of the mother of the Slaws, Slavia, hung in its place, but it was moved to the city’s gallery in 1997, despite the protest of many Prague residents. 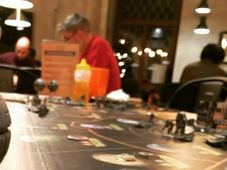 During the times of the communist regime, the café became state property, but it still continued to draw the artistic and eclectic types, even during the normalization period and after the invasion of Prague by Warsaw Pact troops in 1968. Among the guests in those days were Václav Havel, then a dissident and playwright, and the poet Jiří Kolář. 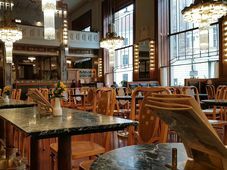 The iconic coffeehouse has also found its way into some works of literature – Jaroslav Seifert refers to it in his book Halleyova kometa, and in 1985, Ota Filip published a novel titled Kavárna Slavia. 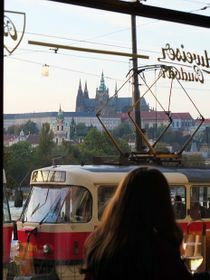 While today, the café draws many tourists, it still remains popular with Prague residents as well. On the quieter weekdays or early in the morning, when the sunlight is reflected by the nearby Vltava river and shines into the coffeehouse, it is easy to see why.